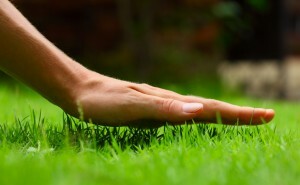 Overseeding is a great way to liven up those brown or bare spots in your lawn. Here we are in week two of our Fall Lawn Care Playbook, and we have some important stuff to go over. Last week we talked about the importance of lawn aeration and how it can help your grass grow stronger by getting more nutrients. This week we are focusing on overseeding and fertilizing, two things you should absolutely follow lawn aeration with, and two things that need to be done in the fall for the best results. We’ve said it before, but fall is great for lawn care for a few reasons. With the summer heat gone, your seeds and grass aren’t at a high risk for drying up. In the fall there’s less of a threat from insects and weeds too. Since the ground holds the sun’s heat better than the air does, soil temperatures will still be warm which helps promote growth. Overseeding is a great way fix a lawn that’s looking thin, and it also helps keep your lawn from thinning out. After aerating your lawn, the new grass seed will have optimal growing conditions since the soil is more receptive to seeds, water and nutrients, and it won’t have to fight healthy grass for sunlight. The result is a lawn with a combination of strong existing grass and healthy new growth. After a long, hot summer your lawn is craving the nutrients it needs to recover. Fall is the number one time of year to fertilize your lawn since the combination of warm days, cool nights and plenty of rain make for the perfect growing season. An important aspect of fall fertilizing is helping the grass roots become stronger so they can last the long winter season. Aeration helps get fertilizer down to the roots of the grass and will help your lawn come back green and lush come spring. For over 12 years, Jason Kahler and his team at JFK Lawn & Landscaping have been providing outstanding landscaping service to homeowners and businesses throughout Howard County, and recently expanded to Montgomery County and Carroll County. 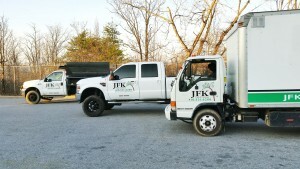 Family owned and operated since 2004, JFK offers services including lawn maintenance, turf enhancement, general landscaping, gutter cleaning, and power washing, as well as snow removal services in the winter months. To learn more about what we do, check out our About Us page or our FAQ section. If you have any questions or concerns about your lawn and landscaping needs, please feel free to give us a call at (410) 531-6208 or shoot us an email using our contact form. While you’re here, don’t forget to follow us on our new and growing Facebook,Twitter,Google+, and LinkedIn pages to stay up to date on our blog and the latest landscaping news, tips, and tricks! This entry was posted on Friday, September 30th, 2016 at 2:26 pm. Both comments and pings are currently closed.